In spite of his dire situation as a prisoner a Roman jail, Paul`s letter to the church at Philippi overflows with joy. Discover Paul's secret to finding joy in Christ as Dr. Warren Wiersbe leads you on verse-by-verse tour through the book of Philippians. Take notice of Paul's single-minded focus remains on Jesus and learn how your joy can also be complete in Christ. Originally published in 1974, Be Joyful is part of Dr. Wiersbe's best-selling "Be" commentary series. With over 4 million volumes in print, these timeless books have provided a generation invaluable insight into the history, meaning, and context of virtually every book of the Bible. Reintroduced to a new generation of believers, this commentary now includes study questions at the end of each chapter for further reflection and application. Best-selling author, minister, and radio host, Dr. Warren Wiersbe stands among the most trusted teachers of his time. Dr. Wiersbe's ability to instruct both new believers as well as Bible scholars sets his work apart from any other commentary series. 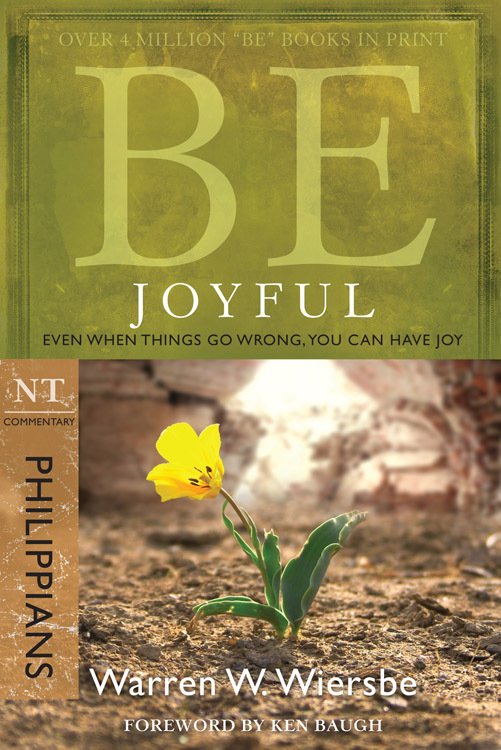 Be Joyful (Philippians) by Warren Wiersbe was published by David C Cook in June 2008 and is our 5917th best seller. The ISBN for Be Joyful (Philippians) is 9781434768469. Be the first to review Be Joyful (Philippians)! Got a question? No problem! Just click here to ask us about Be Joyful (Philippians).